Margot Dorfman is a visionary leader who has dedicated herself to dramatically advancing the economic and leadership opportunities for women. As a founder and CEO of the U.S. Women's Chamber of Commerce, Ms. Dorfman has championed opportunities to increase women's business growth, economic security, career advancement and leadership position. Ms. Dorfman believes that women have established a critical mass of business ownership, education, executive leadership, and political clout which enables us to establish our own path. Through the ownership of the power of this critical mass and the unification of our collective strength, we are moving beyond being just as a sought-after consumer market -- taking our rightful place as the most powerful economic force in America. Through the ownership of our power, we behave differently, establish and invest in new economic platforms, and align our political votes and purchasing power with our own economic and community interest. 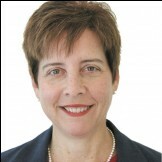 Ms. Dorfman has an extensive background in business, business ownership, publishing and nonprofit leadership. She is a sought after speaker on economic, business and women's issues and regularly provides advice and council to local, regional and national business, community, news and political leaders. Her personal goal is to see economic and leadership parity for women in her lifetime. Ms. Dorfman holds a Master's of Education from Lesley University and a B.S. in Education from Northeastern University. Her corporate experience includes over ten years in executive positions with General Mills and other Fortune 500 firms.